On November 29 I was pleased to experience part of the Christmas festivities at the Minnesota Fishing Museum in Little Falls, Minnesota. Included was a book signing and interview on AM960 KLTF’s popular Party Line. 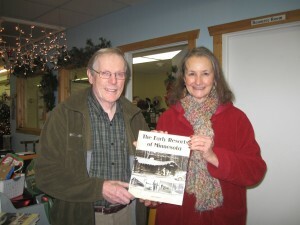 An attached photo taken at the book signing shows Pam Schilling buying a book. Pam and her family are mentioned in the book because of the record number of years they stayed at the Blue Front Resort on Lake Alexander, near Little Falls. Over the last three Christmas seasons, the Minnesota Fishing Museum has become a small forest of fully decorated and lighted Christmas trees. The trees, including decorations, are for sale as part of a silent auction to raise money for the museum and organizations which donate time and trees. This year from November 23 to December 2, over 35 trees were in the auction, plus 30 wreaths and gift baskets (click here for an additional news story on this fundraiser). The resorts in my book, The Early Resorts of Minnesota, have been closely associated with fishing, which was the main reason for their development. Nearly every early advertisement stressed fishing and listed the species that were important to the resort’s lake. My family had strong ties to fishing, including my sister’s marriage to Jerry E. Fuller, whose parents owned a popular fishing tackle business in northern Minnesota, Fuller’s Tackle Shops. I learned about lures, reels, rods, and local fishing when I worked at the shop in Park Rapids. All Minnesotan’s as well as visitors, are fortunate to have had Al Baert and Morry Sauve build the Minnesota Fishing Museum. The collection of fishing paraphernalia found at the museum will likely reach the memories of every visitor. I was pleased when Al Baert, the founder, endorsed my book. It is well worth your time to visit the museum at 304 West Broadway, Little Falls, or learn more about it at http://www.mnfishingmuseum.com or call Mavis Buker, Director, or Diane Grebinoski, Assistant Director at (320) 616-2011.